Usually when I purchase a game, if the soundtrack edition is only a few dollars more, I'll usually grab it since, as you know, I'm a bit of a VGM aficionado. So if I go out of my way to buy the soundtrack for a game separately, it usually has to be something that's pretty special - Risk of Rain's soundtrack is one of them. Chris Christodoulou (what an awesome name) has delivered a soundtrack that not only fits the theme and mood of the game (i.e. exploring a hostile alien planet alone in all its 8-bit glory) but it manages to be a pretty good album standalone. "...you could say there's a 70s-phychedelic[sic]-progrock vibe going on, a sort of electronic/rock hybrid of sounds. Guitars, basses, keys and good-old drums, mixed with synths, choppers, bit-crushers, vocoders and more drums..."
The closest track I could think of in terms of capturing the Pink Floyd vibe would be "Moisture Deficit" which starts off sounding like backing music to an old Sean Connery James Bond film but has got enough of a blues sound and power chords to be considered a work of Pink Floyd's. I also have a few other favourites on this album including the toe-tapping "Dew Point", the hypnotic "Monsoon", the epic sci-film sound of "Aurora Borealis", and the strangely alluring 11/8 time masterpiece "25.3°N 91.7°E". So you won't need to look hard for some quality music on this album as most tracks lift their own weight, except for maybe "Intermission", but you'd probably expect that with a name like that. 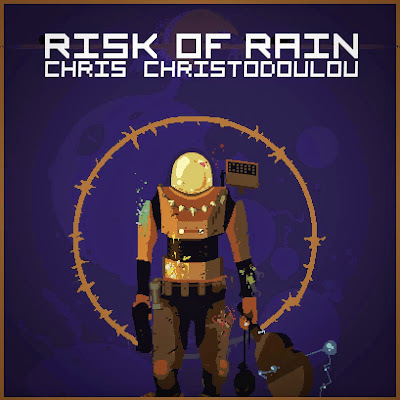 Chris Christodoulou has done a fantastic job in not only making a suitable soundtrack for sci-fi roguelike Risk of Rain but an album that's very pleasing to the ear for those who like a bit of chiptunes added to their prog rock. If you're looking for quality indie game soundtracks, this is one of them. You can grab this album off Chris Christodoulou's bandcamp page for €4.